My brother is in Bangalore and we are in Chennai. Visits are common since it’s just 6 hours of travel. Many a times I have packed sleeveless t-shirts for my son then find out that its shivering cold (for us, at least) in Bangalore. Being used to Chennai’s tropical hot weather, cool weather is not something we are used to. So now a days the standard practice is to call my SIL and ask for the weather status there. Whatever she says, I pack all the full sleeve or half sleeve t-shirts and pants. And if its past October, I carry the jacket too. Just in case, you know! So for someone who is used to Summer all through the year, presenting Winter foods is something funny. Yet, here I am, with another winter recipe – Vegetable Chili. This pairs very well with basmati rice. Check out the Blogging Marathon page to find out who else is participating in this month’s 30 day marathon. I had picked a packet of dried mixed beans from Nilgiris supermarket. It was a mix of chana, small rajma, dried green peas and some other varieties. Wash and soak the mixed beans for about 6 hours or overnight. Pressure cook the next morning for about 4-5 whistles or till the beans are completely cooked. Keep aside. Once this is cool, it can be frozen too. For the chili, heat the olive oil in a big pan. Add the onions and garlic and saute till pink. Add the diced capsicum and the spice powders. Cook for 3-4 minutes stirring often. Add a spoon of water if the masalas stick to the bottom of the pan. Add tomato puree and bay leaf. Once it comes to a boil, add the beans, stock, jalapeno and seasonings. Bring it to a boil. Cover with a lid and reduce the heat. Let it simmer and cook for another 20-30 minutes, checking the seasonings and adjusting in between as needed. Serve on a bed of cooked basmati rice or bread along with a salad. Note: You can add soya nuggets, corn and veggies to this recipe . 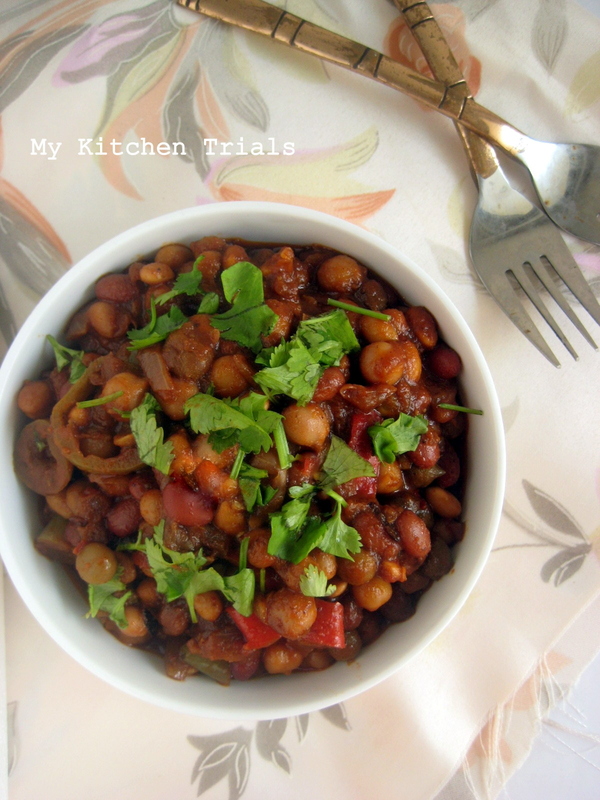 Linking this recipe to Swathi’s Favorite Recipes hosted this month by Pallavi. The theme is Bookmarked Recipes. wow..this sounds great..love the idea of using pulses with chilly ..should be yum! Love it Rajani. I used just rajma but your idea of mixed beans is yum. Haha! Cold Bangalore indeed! And when i moved to Bangalore from Delhi, i wondered how anyone could wear jackets in such pleasant weather! And yes, the bean chilli sounds good, looks good, and i can imagine eating it on cold wintry day for lunch with a jeera pulao maybe! Nutritious packed and definitely a hearty vegetable chilli..I can have that bowl just like a snacks. That’s a nutrition packed chili. Same feelings when I moved from Trichy to Bangalore for work! The pleasant weather of Blore was cold for me. But now a smile creeps when someone says its cold out there. This is a perfect winter food. Spicy and healthy! It looks so delicious. What a filling and protein rich dish. Looks delicious. Lovely picture Rajani. Talk about cold weather and I can never pack properly! Even in Ahmedabad, I finally wore that jacket for want of luggage space!.. :0) and once we went to Kodai during Aug and I didn’t pack any warm cloths. Imagine we all ended up shivering through the day!..I never found Bangalore to be cold, anyway..it’s fun to wear jacket! great idea combo of beans .. love the color it turned out. 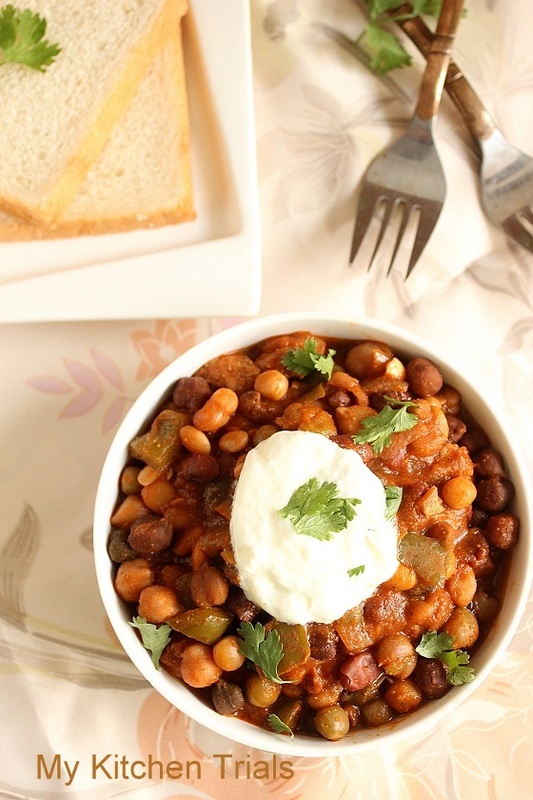 delicious combo of lot of beans and legumes… so nutrituous!! I can understand the climate predicament. And I can almost feel the aroma of this chilli being served with basmati rice.What a pair! !